Despite the numerous box office hits that he delivered as a producer and director, Ramanand Sagar did not probably craft any film that came remotely close to going down in the history of popular Hindi movies as an epochal cinematic creation. Yet, his eventful career as a movie mogul will always remain an integral part of Bollywood folklore. Ramanand Sagar’s death on Monday, a couple of weeks shy of his 88th birthday, has snapped one of the Mumbai film industry’s last active links with its wonderfully fecund golden era. His rise was a classic story marked by as much drama as any film that he made in a career spanning well over half a century. After a series of odd jobs, the Lahore-born Sagar began his professional life as a gifted literary writer who earned generous critical accolades from legendary Urdu litterateurs like Krishan Chander and Sadat Hasan Manto. When he plunged into the movie business, he brought the sensibility of a writer into the world of mass entertainment. No matter what genre he dealt with – costume drama, spy thriller, love story or period epic – he never diluted his commitment to the cultural and social values that he was steeped in. He worked with the biggest stars of the day and tasted runaway success at the box office, but the roots of the empire he built remained grounded in his acute sense of where he had come from. So, while Sagar produced and directed a large number of commercial successes like Arzoo, Aankhen and Geet, his fame rests to a great extent on the script and dialogues that he wrote for Raj Kapoor’s classic musical, Barsaat. It was one of the nearly 30 screenplays that he penned before branching out on his own as a producer-director. Sagar wrote scripts and dialogues for several of S. S. Vasan’s Hindi films, including Insaniyat, starring Dilip Kumar and Dev Anand in a rare pairing; Raj Tilak, with Gemini Ganesh and Vyjayanthimala; and Paigham, a multi-starrer featuring Dilip Kumar, Vyajayanthimala and Raaj Kumar. He went on to direct films like Ghunghat and Zindagi for Vasan’s Chennai-based Gemini Studio. Sagar’s strength as a writer obviously stemmed from his strong literary moorings. In the late 1930s and early 1940s, he was an active journalist working on the staff of leading Lahore newspapers. He migrated to Mumbai with his family during the upheaval caused by the Partition of India. Having witnessed the horrors of the Partition riots from close quarters, he recorded his experiences in the classic Hindi novel, Aur Insaan Mar Gaya. He went on to author several more short stories and novellas, as well as a three-act play, which was performed on stage by Prithviraj Kapoor. His film production company, Sagar Arts, the banner under which he made all his films since its inception in 1950, went into a bit of a decline in the 1980s. 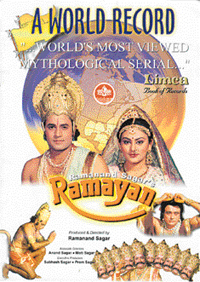 And then the 91-episode television serial, Ramayan, happened. It not only gave Sagar Arts a new lease of life, it changed the television viewing habits of most Indians for good. With Sagar’s death, a substantial slice of Hindi showbiz history has passed into eternity.